Rather splendid photo received from Mark Dawber (New Zealand) investigating a vehicle from a series of pictures of many unidentified forms of transport. Can we help with advising name of manufacturer. -- Background of the photo is French as indeed is the car. The registration suggests the car came from St Etienne which is the capital of the Loire. The car resembles the contemporary Mercedes model but is a cca 1903 Peugeot Type 42 Rear-Entrance Tonneau, with 4 cylinder 12HP engine. 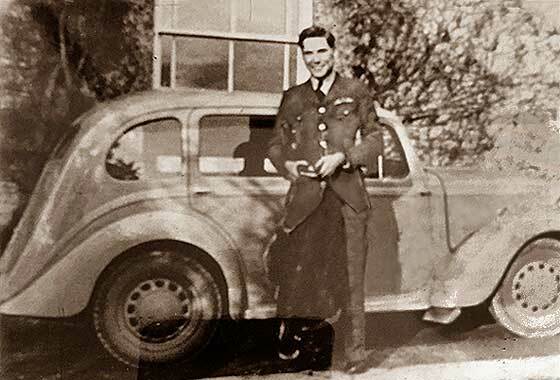 Another rather splendid photo received from Mark Dawber (New Zealand) investigating a vehicle which seems to be notated as a Ford N. He thinks it is a Humberette? -- We agree, not an American Ford but a British Humberette. From the radiator and the side panels, and having wire wheels, it seems to be a well used cca 1903 Humberette 5HP with a De Dion Bouton engine, made in both Coventry and Beeston. It cost 125 Guineas; 6.5HP Humberette had artillery wheels, at 150 Guineas. 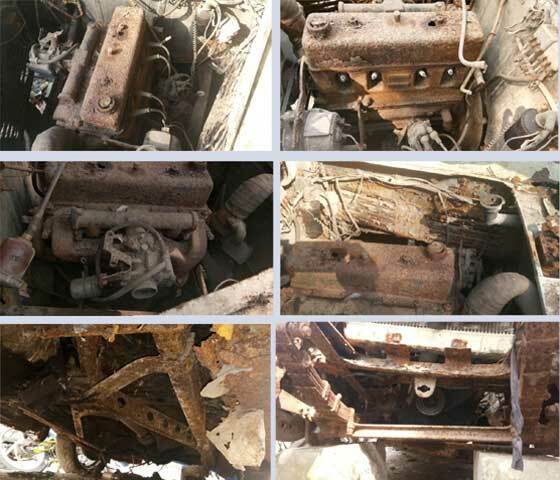 Rather blurry photo received from Jan Hauptmann (Germany) saying "Can you tell me what kind of vehicle this is? Thank you. -- We have tried to improve on the photo but it seems to have been shaken on taking, so would not really sharpen. Couple of our experts agree this is a cca 1904 Mercedes Phaeton, probably the 40HP. Mercedes cars were built by Daimler Motors in Germany from 1901 for Emil Jellinek, agent in Nice, named after his daugter. Daimler and Benz amalgamated 1926. 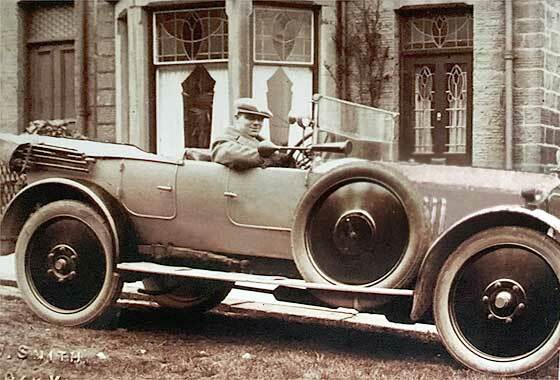 Another rather splendid photo found while surfing the internet in the process of identifying ancient automobiles. We think this one came from Australia. Can we help with advising name of manufacturer. -- Rather oversize radiator suggests a British manufacturer, originally of steam cars in 1899. 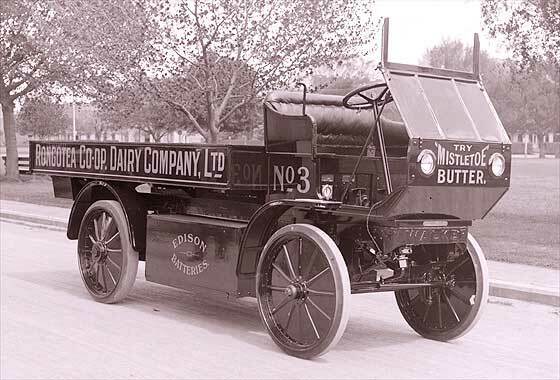 In 1907 they commenced commercial vehicles including supplying over 70% of London's busses, including petrol-electric double decker busses. 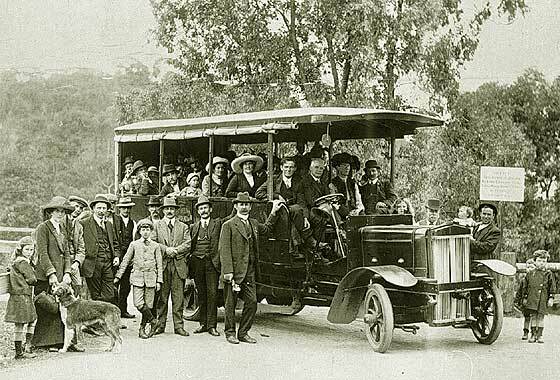 This is a c1907 Straker Squire Charabanc. 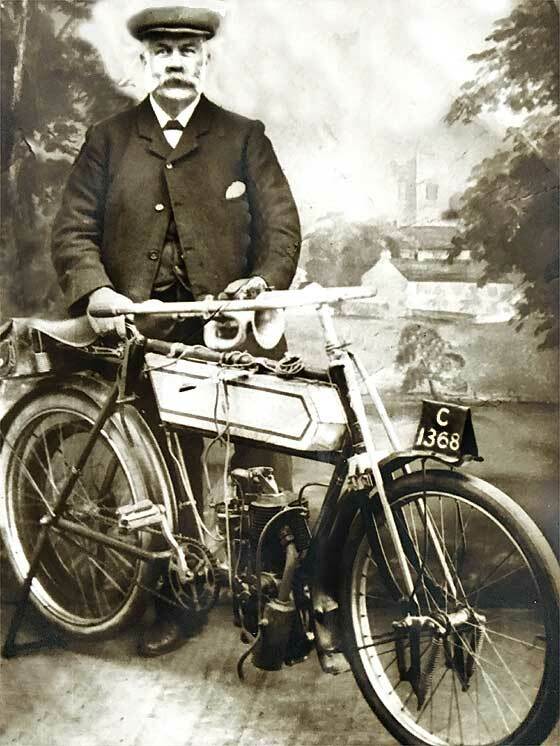 Puzzling photo received from Caryl Bowles (Mrs) (UK) saying "I am a member of Gargrave Heritage Group and wonder if you could identify first motor bike in the village? -- Not a positive ID but likely a cca 1907 Brown Brothers Motorcycle; three sizes. Registration is Yorkshire West Riding CC cca 07ish. Very unusual springing to the front wheel, OHV engine, no gearbox, exhaust offside; largely match. Springing patented but not sure if 'bought-in', but could not find similar used elsewhere. 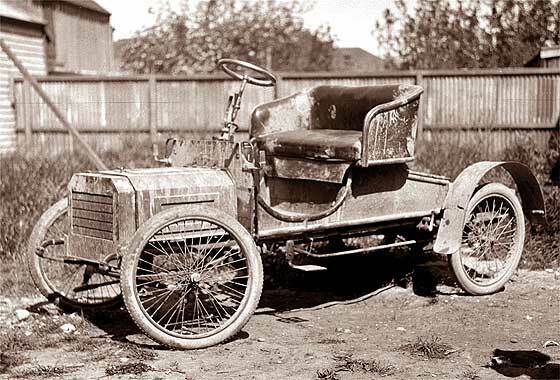 Another interesting photograph worth showing on our Help Pages, and one found while surfing the internet in the process of identifying ancient automobiles. Can we help with advising name of manufacturer? -- Does rather help to have the manufacturer's name faintly on the bumper. This is a cca 1909 Walker Electric Truck from Chicago, but also available in Britain and New Zealand. Became Commonwealth Edison 1920 and used their batteries as prominently displayed on battery case. 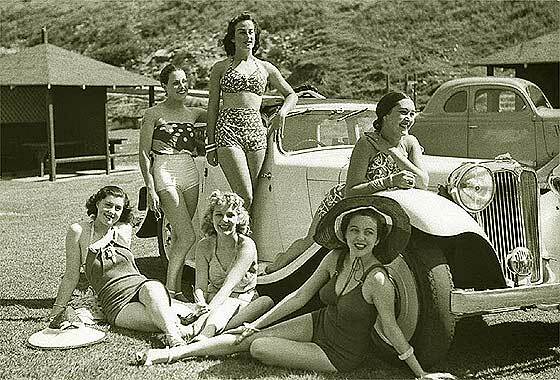 Another rather splendid photo found while surfing the internet in the process of identifying ancient automobiles. We think this one came from Korea. Can we help with advising name of manufacturer. 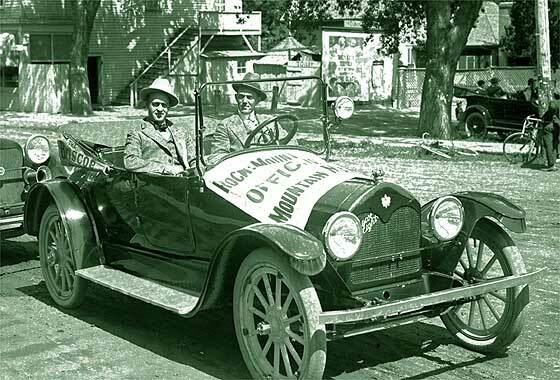 -- Proving just how popular was the world-wide use of Ford Model Ts. 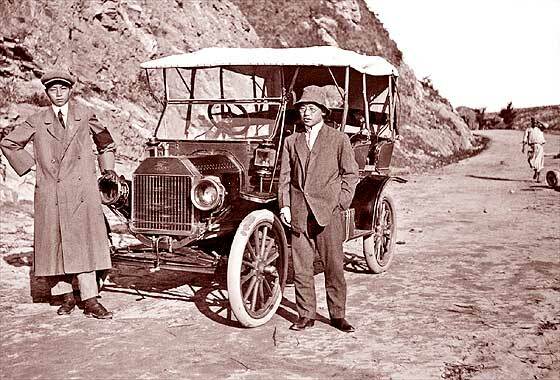 The car looks relatively new and is an early square edged bonnet cca 1911 Ford Model T used as an autobus, probably more as a Taxi, in Konju. Konju seems to be in what is now North Korea. Rounded bonnets 1916. Another request for identification of a vehicles received from our regular contributor Joao Ferreira (Portugal) who asked if we could help him identify this car photographed in North Portugal. 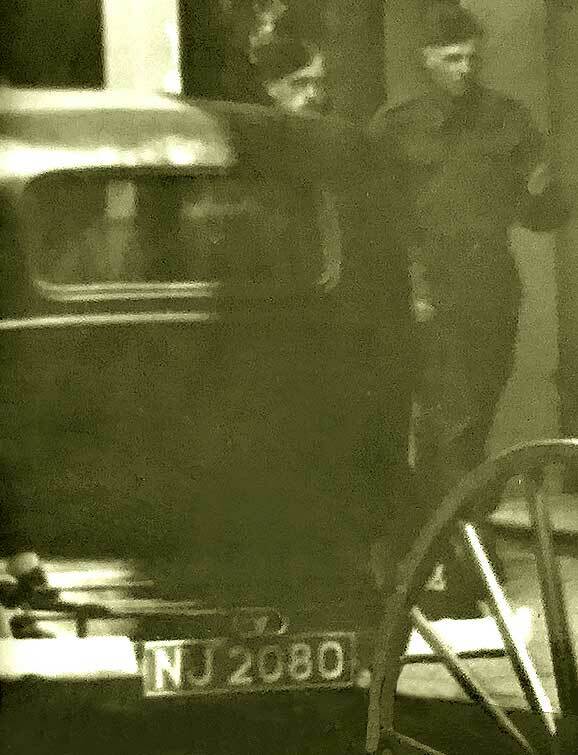 -- The car in the background with round bonnet is a French Car built in St Denis, north of Paris by boilermakers started in 1850. 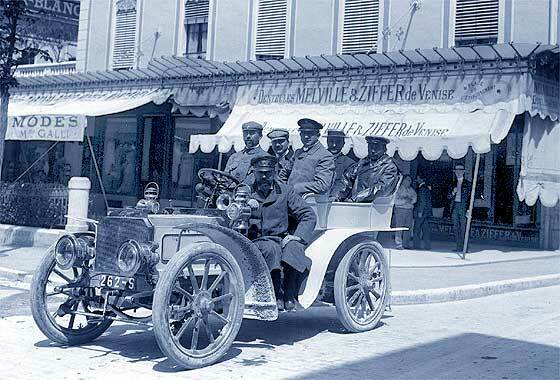 First car in 1904 and first in France to offer a 6 cylinder car in 1909. Tsar Nicholas of Russia had a few. This is c1912 Delaunay Belleville Coupe Chauffeur. Co ended 1950. Surfing through the internet in attempting to identify old vehicles we often come across photographs or old Postcards of very interesting ancient machinery which has not yet been identified, so we have a go ! As the photoare on more than one website, difficult to attribute the origin. 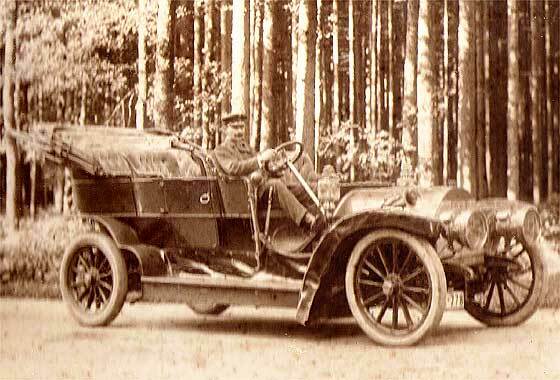 -- Photo possibly by Adam MacLay showing a lovely French cca 1913 Delage Two-Seater & Dickey, probably the Model TR of 12HP. Bankrupted 1935, became part of Delahaye, making Delages to 1953. 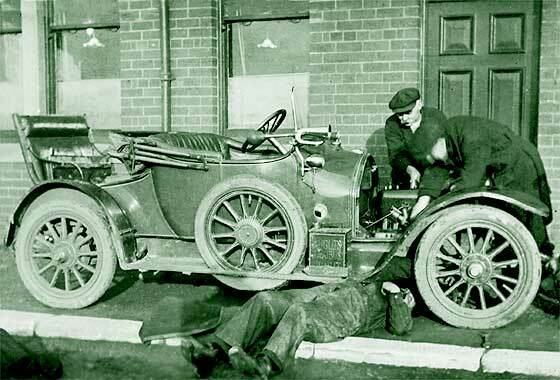 Unusual photo which was interesting to solve was sent to us by Phil Kramer (UK) of his great grandfather's car found while researching family tree. John Jameson fairly important in the area, lived in South Hylton, near Sunderland, born 1853, died1920, -- No rad or bonnet so thanks to David Hales for identifying this as a cca 1914 Darracq 12hp Two-Seater. Points of note are; cranked windscreen support, scuttle filler cap, 6 wheel studs, side air vent, widescreen mounted side lights. Another rather splendid photo received via Mark Dawber (New Zealand) investigating a vehicle which is unidentified on more than one website, so problematic attribution. Can we help with advising name of manufacturer. -- American car, manufactured in Jackson, Michigan. Perhaps more famous for its cyclops headlamp model, this is a cca 1916 Briscoe Model 38 V8 Touring with short lived widows peak radiator top. Option with the 4 cylinder model was to use 4 , and later retrofit the V8. Another request for identification of a vehicles received from our regular contributor Joao Ferreira (Portugal) who asked if we could help him identify this car. -- The vehicle in the foreground is an extremely rare car from France made by an aircraft engine manufacturer started in 1911, and cars 1919-'24 in Greneviilliers, Paris. Single model policy with a 1,243cc four cylinder sidevalve made in three wheelbases and four bodystyles. This is a cca 1919 Secqueville-Hoyau Coupe de Ville. Another fuzzy puzzling photo sent to us by Jason Palmer, Melbourne, (Australia) saying he recently purchased this photograph and has not been able to identify the light car with interesting pedestal mounted side lights. Sun is reflecting right in the wrong spot; glare or badge?" -- Thanks to David Hales and Tim Harding for info that this is cca 1921 Briton 9.5hp Tourer, engine no 6019 , chassis 6121/2, first registered on 9/4/21, last known owner 30/6/24. Post-war Britons are very rare. Very puzzling photo sent to us by Jason Palmer, Melbourne, (Australia) saying he recently purchased this photograph and has not been able to identify the vehicle. Magnifying the radiator badge shows script name (not clearly) - like a Coy...?? 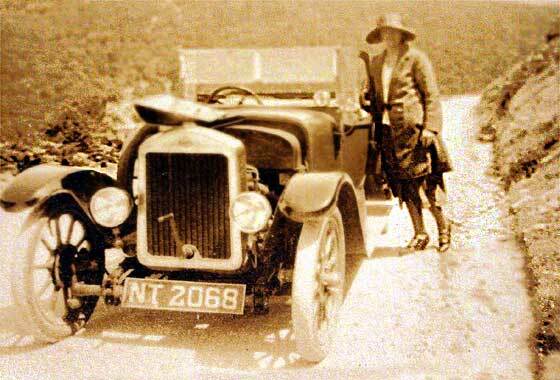 -- We had this photo on HP 115 as UNIDENTIFIED, possibly a Wolseley or a Crouch. Registration is 1921 Salop (Shropshire CC). We have now had a definite view from our Tim Harding that this is indeed cca 1921 Crouch Tourer, Coventry 1912-25. Another rather splendid photo received via Mark Dawber (New Zealand) investigating a vehicle which is unidentified on more than one website, so problematic attribution. Can we help with advising name of manufacturer. 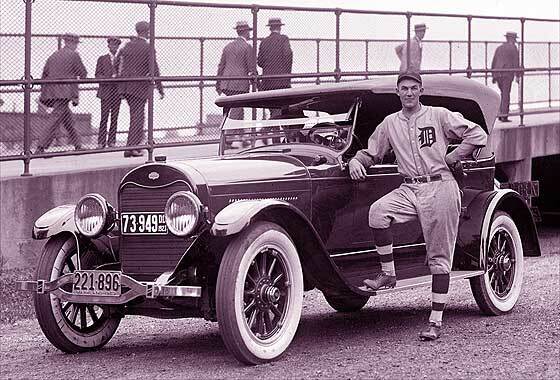 -- American car, manufactured in Dearborne, Michigan, by a company founded 1917 by Henry Leland who named the company after the first President he voted for in 1864. Bankrupted 1922, and purchased by Henry Ford. This is a cca 1922 Lincoln Model L Touring. 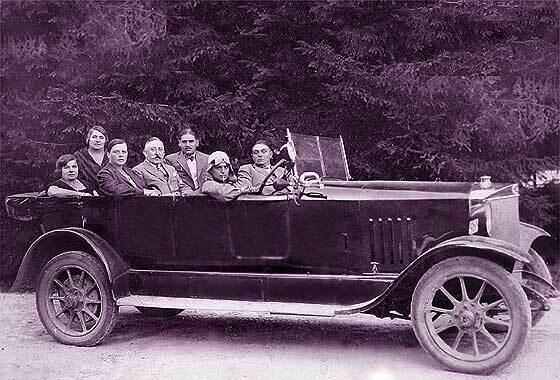 Rather lovely photo received from Caryl Bowles (Mrs) (UK) saying "I am a member of Gargrave Heritage Group and wonder if you could identify the car in the photo, possibly owned by Sir Matthew Wilson of Eshton Hall. -- Identification feature of upturned exposed cantilever external rear spring led us to think it was an Angus Sanderson. However our Tim Harding advised that this is an early cca 1922 Vauxhall 14'40 M Type. Car should have flutes on the rad but these not visible on unclear photo. Another rather splendid photo received from Mark Dawber (New Zealand) investigating a vehicle which is unidentified on more than one website, so problematic attribution. Can we help with advising name of manufacturer. -- Spitzkuhler radiator much favoured in areas with Tutonic influence, but not Germany, instead Austria. 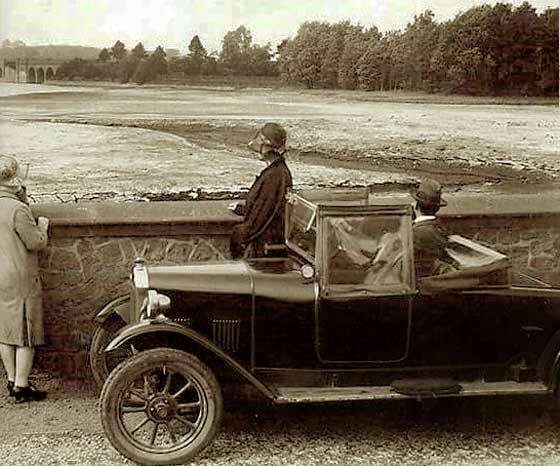 This is a car made by Österreichische Waffenfabriks-Gesellschaft (ÖWG) cca 1923 Steyr Type VII 12'50 Tourenwagen. Steyr-Daimler-Puch made cars to 1959. Another photo which gave us trouble was sent to us by Roger Lovell (UK) saying that whilst undertaking some local research he came across this image and hopes we can help him with identifying the make of car. The location is Swithland Reservoir in Leicestershire. -- Thanks to Tim Harding for confirming this is a Lagonda but as 11.9 models had no louvres we had problems in being positive. 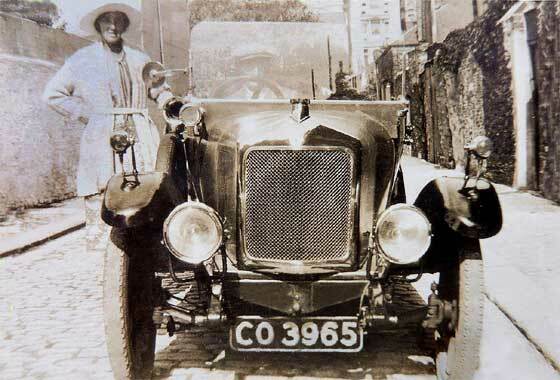 We have finally located photo of a cca 1924 Lagonda 12'24 Two-Seater with two sets of louvres. 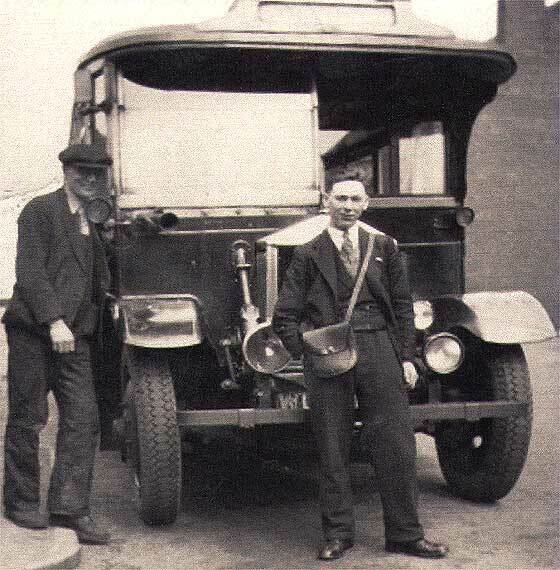 Interesting period photo received from regular contributor Bill Stothard of the Cudworth Local History Group (UK) saying he knows that commercial vehicles are not our specialty, but can we help with the identification of this 'Overtype/Forward Control' bus.-- Relatively sure this is a cca 1931 Albion Viking PM 28 Bus. These were made 1927 to 1932 and were a follow on to the Viking 26. Many were later rebodied. PM/PMA had the four cylinder and PMB/PR a six cylinder petrol engine. Rather blurry scren-grab received from Henry Hammar, Oxelosund (Sweden) taken from a old Finnish movie, so quality is not so good. 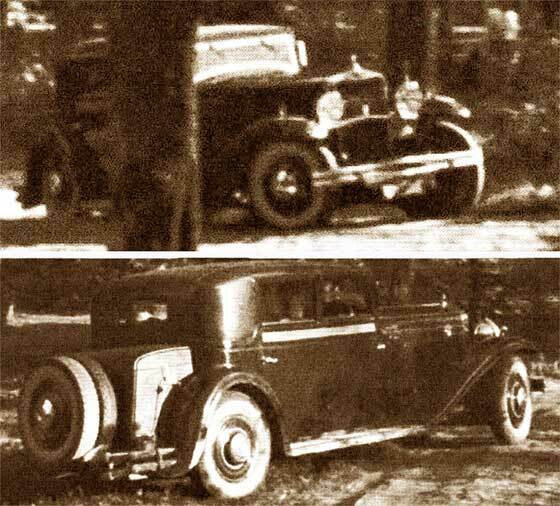 Rumours that the car was a Hispano Suiza, body possibly Felber & Fils in France. Delage is a possibility.-- We have some doubts about HS. Tie badge bar is curved and HS ones are generally straight. HS also generally go for single wider bumpers. A cca 1932 Delage D8 Berline has much more going for it, especially with the Felber & Fils coachwork. Rather poor photo received from Noel Beauchamp of the Swindon Heritage Website (UK) asking "Is it possible to identify the car and date of registration from the attached photo please?" -- Registration NJ 2080 was issued by Sussex County Council late 1933. Left petrol filler, split rear bumper, no spare tyre, rear light central over plate with two lenses, indicated to our Tony Oakes this was a cca 1933 Vauxhall Light Six Saloon, introduced 1933. Similar rear view of one on : Help Page 09. Surfing through the internet in attempting to identify old vehicles we often come across photographs or old Postcards of very interesting ancient machinery which has not yet been identified, so we have a go ! As the photo is on more than one website, difficult to attribute the origin. -- Mentioned on one site as a Singer, NO this is a forerunner to the Jaguar, being a cca 1934 Standard Swallow SS 2 Light Four Saloon. Company name was changed to Jaguar in 1945 due Nazi connotations. This is a photo-of-a-photo, received from Noel Beauchamp of the Swindon Heritage Website (UK) asking "Sorry to ask again but could you please help us with this on also? Is it possible to identify the car ?" -- Unfortunately no registration visible for precise dating. Many cars of the period had sloping rear bodystyle but this car has down curving body line and no louvres on the bonnet. Once again our Tony Oakes advised it is a cca 1936 Hillman Minx Magnificent Saloon, 1936 to 1938. One of a number of interesting photos sent to us by Andrew Kostin from Moscow (Russia) who is a collector of old photos. 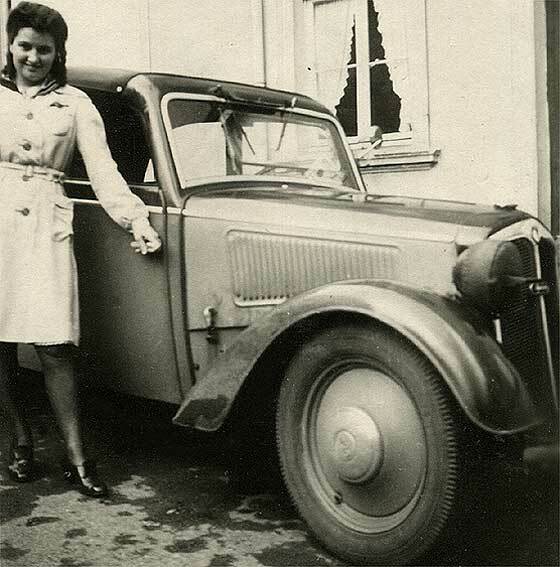 Can we identify the car once owned by the former German Red Cross member. This snapshot was taken somewhere in 1960s. -- German car made by the world's largest motorcycle manufacturer in 1920s who were Dampf-Kraft-Wagen company, who started in 1919 with stream vehicles. This is a cca 1938 DKW F7 Cabriolet, front-wheel drive, two-stroke engine. Puzzling set of photos received from Manreet Sarkaria (India?) saying he cannot identify car. -- Enclosed engine bay with side louvres suitable for lid type bonnet. Alternator? Manreet mentions 19" wheels, with Rudge Whitworth spinners, Hartford shock absorbers, MOWOG engine block, both manifolds on right side, track 44" and wheel base 89", 2M3&W2 on left upper of block, another marking 4JAN, another number on exhaust manifold 16217, cross brace on chassis. Our experts have so far not come back with anything positive. Need Help Please!